Have you ever felt demotivated when tasks on your to do list become stale over time? Or that you’re not sure what to do when they are stale? We've all been there and it's frustrating to keep seeing it day in and day out on your list, and eventually you grow to ignore it all together. Well, we thought building something to help you tackle this obstacle will then help you complete that task along the way. Introducing... Stale Tasks Notification! 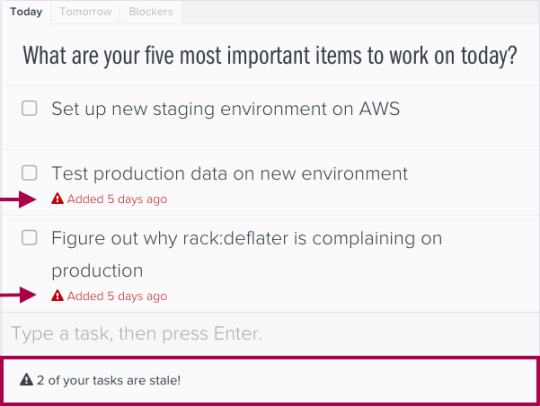 What is Stale Tasks Notification? You might have noticed a timestamp under your tasks whenever they get carried over to the next day. That timestamp turns color as the days progress if it's still on your Dayboard. At first, it's green then eventually turns yellow, then red. When things turn red, it's alarming — we know, and it's meant to be. That's when you know you have some stale tasks on your list. 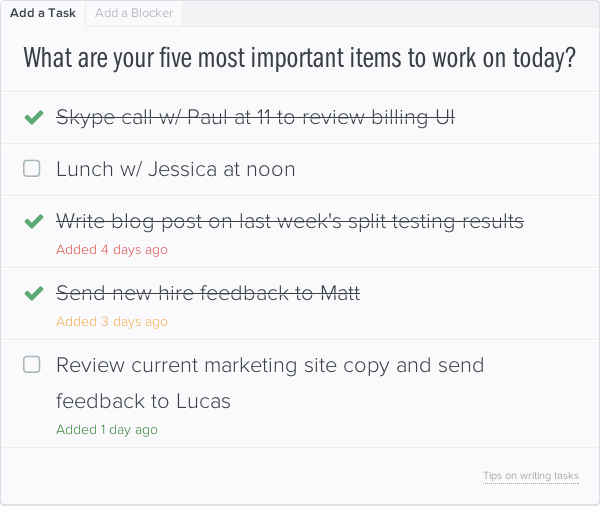 Now, you can see when stale tasks need your attention on Dayboard. Under your task list, a notification will appear when you have tasks that are more than four days old followed by a warning sign. Simply click on the notification and a pop-up with some Pro Tips will appear to teach you how to overcome these issues as soon as they come up. However, if you are using Dayboard in a team, and you have some Blockers mentioning you by your colleagues, that notification will come up first before the Stale Tasks notification. This doesn’t mean you shouldn’t pay attention to them, but you can either help out your colleagues first or let them know you’ll help them soon if you decide to deal with your tasks first. For now, this feature only works in the web app. We know pro tips might just be scratching the surface to help you overcome the problem of stale tasks, but it's our first attempt to solve this productivity issue. We do have plans to improve this feature in the near future. Meanwhile, we hope this is helpful in helping you achieve more. And again, we love to hearing your feedback — even the negative ones. 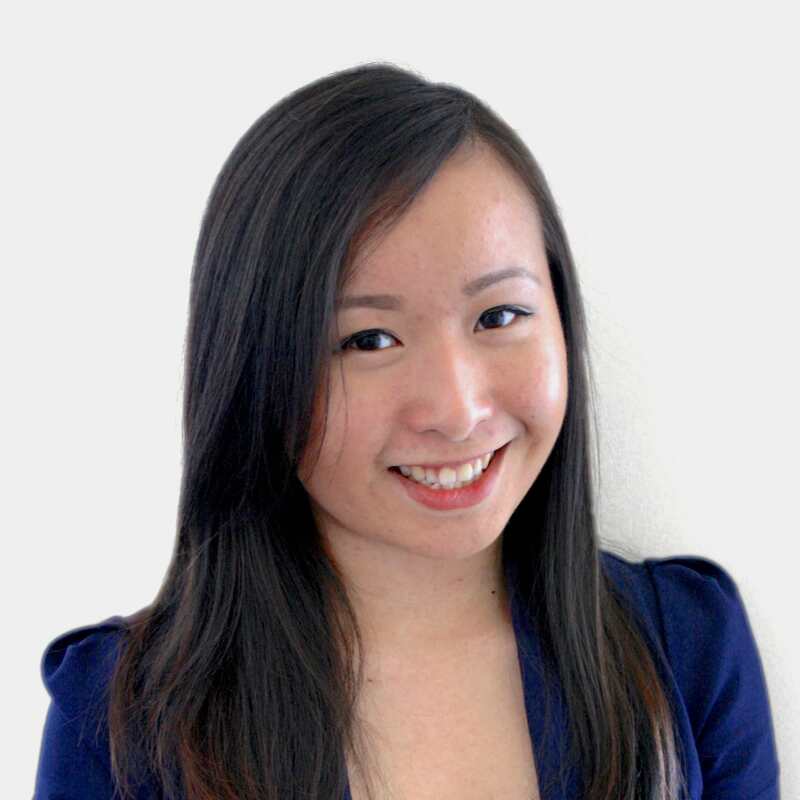 Jennifer Lo is the co-founder and marketing lead at Dayboard. She's always down for an outdoor adventure, good company, and great wine. We'll send you 1 - 2 articles every month to help you focus on what’s important, do amazing work, fight distractions, or find happiness in your work. Brought to you by Dayboard, a daily task management app for effective teams. © 2016 Dayboard. All rights reserved.